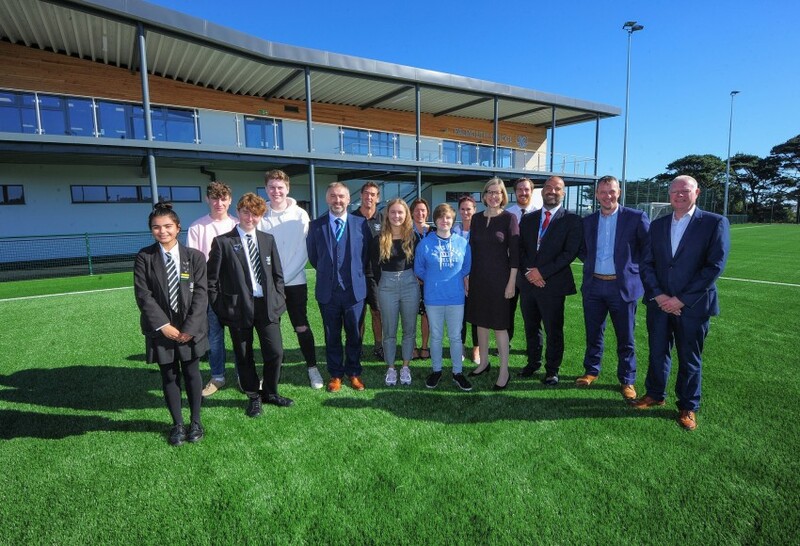 The official completion of the state-of-the-art Sports Hub was marked by Sarah Newton MP for Falmouth School and the town of Falmouth on Wednesday, meaning that the building was handed over by contractors Kier Construction as preparations for the official opening to the public in the coming weeks continue. Falmouth School were awarded a £362,000 grant from the Premier League & The FA Facilities Fund towards the project. The school worked alongside the Football Foundation and the County FA to compile a five-year Football Development Plan, which is a vision of how sport will be played on site with an emphasis on increasing participation and part of the growing partnership with Plymouth Argyle FC. The new facility comprises a floodlit 3G playing pitch, state of the art gym, fitness suites and balcony viewing point and changing facilities. The site will be used by students, members of the local community and local sports clubs and teams. MP for Falmouth Sarah Newton, said “As a Falmouth School girl I am incredibly proud. This is a remarkable achievement and such a fantastic facility for this generation and future generations to come. It wouldn’t have happened without the fantastic leadership of Brett Miners and Jem Wallis, who have shown huge determination and at times bravery through all obstacles thrown at them. This project shows what you can do if you never give up, it’s a proud day for us all. CEO of the Falmouth MAT Brett Miners, said “There have been some tough moments to overcome in order to get here, but what we have here in front of us today validates all that hard work from everyone involved. The support we’ve had from Sarah Newton has been immense throughout in bringing this state of the art facility to our community’. Falmouth School would like to place on record their thanks to [the FA for their funding, Kier construction for delivering the superb building work and McArdles for providing the 3G pitch]. Full details on the official opening of the gym, classes, times, prices and other facilities will be available soon. Members of the public are welcome to try out the school facilities free of charge from 8am-8pm from Monday 1 October – Friday 5 October and 10am-2pm on the weekend of 6-7 October. For more information, please visit http://www.falmouthsportshub.co.uk/. Please note the Sports Hub will be closed from 4pm on Thursday 4 October as Falmouth School Open Evening tours will be taking place. As the project draws ever closer to completion, we have had a busy summer of installation which has included signage, building panels and the laying of the tarmac. Equipment has been delivered and we will see our new green pitch very soon! Things are getting really exciting now. 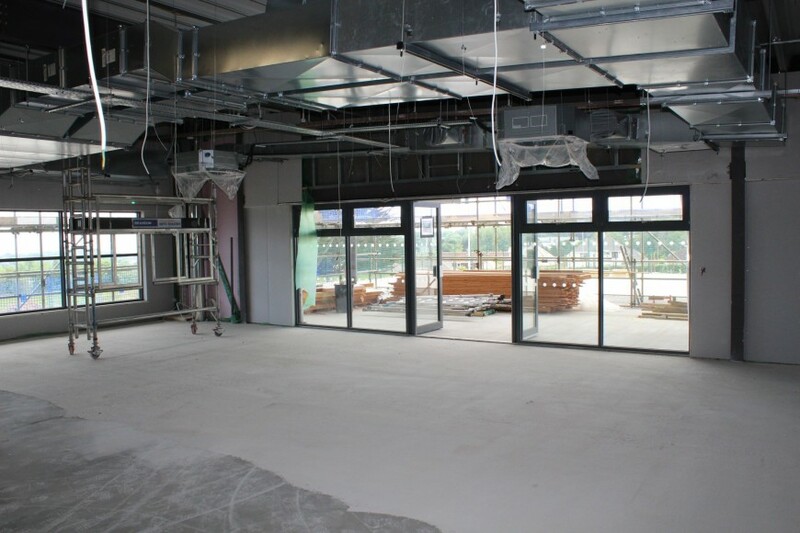 The new pavilion for the sports hub is close to completion and we expect this to be done towards the end of July. The 3G AGP and access roads will soon follow and the facility will be opening in the Autumn. Watch our twitter and facebook feeds for updates. 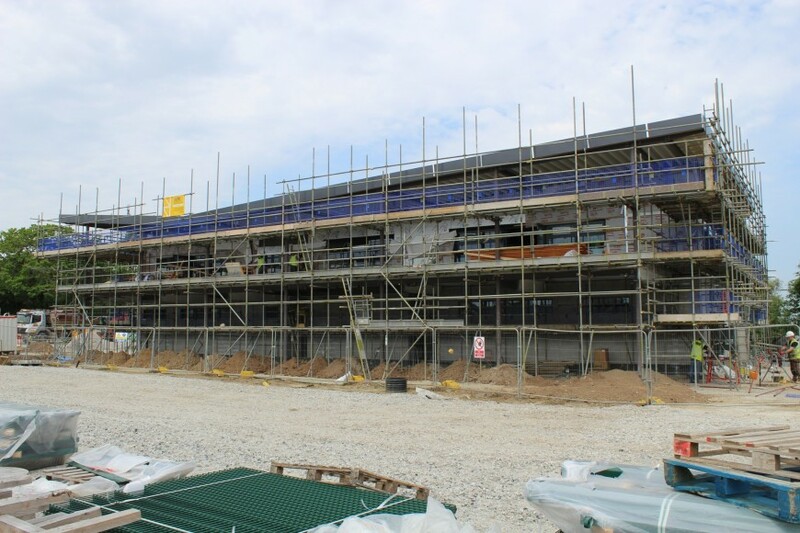 The new state of the art gym and viewing balcony are beginning to take shape, with things moving quickly every day! The school had argued that community use of the facility was key and successfully applied for grant funding through the Premier League and FA Facilities Fund as a result of the positive impact the planned facility would have on the local community. Thankfully after a being under threat by reduced hours of community use, these funds are once again accessible to the school now that it has won its planning appeal for extended opening hours. The community will benefit from the development of some amazing new sports facilities which will bring the town into the 21st century and into line with many other towns in Cornwall. In a time when austerity has cut back on publicly funded developments the school has managed to fund the project predominantly through its own resources by selling land for housing and redeveloping the former Budock Hospital site. The sports hub will bring a full sized third generation artificial turf pitch with floodlighting facility and new grass pitches all alongside a sports pavilion with changing and gymnasium and fitness suite for the students at the school to use as well as community clubs and members of the public. Work on the pitches on the old hospital site is now well underway and the levelled pitches are beginning to take shape. The sports fields and facilities at the school cover a vast area and standing on the middle of the fields you can really get a sense of what a positive impact this development will have on the school as the site becomes one single site which is far more accessible for everyone. The pitches will be complete by the summer in line with the planning requirements for the housing on Union Corner that is currently also under construction. “Things are moving on apace now for the construction of the Sports Development at Falmouth School. Thanks to everyone for their continued support throughout the construction, these are really exciting times for the town. The views from the pitches are fantastic and the scale of these facilities is second to none in the county,” he added. 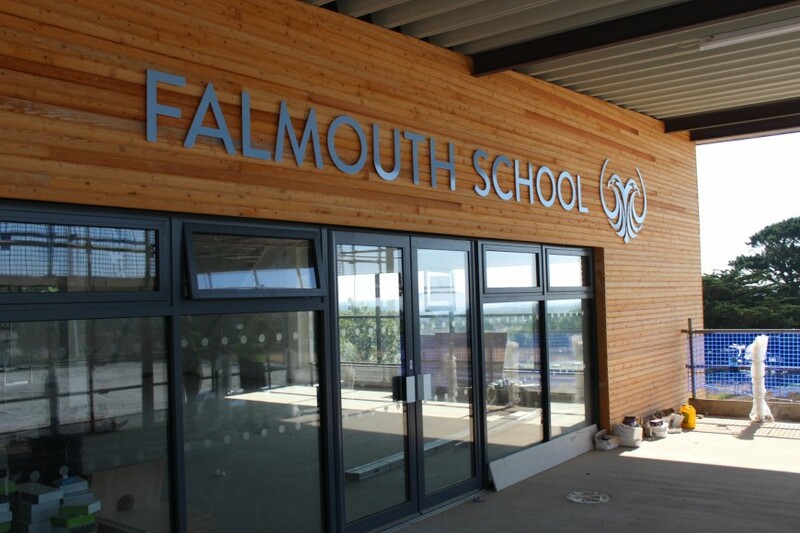 Things are moving on apace now for the Sports Development at Falmouth School. 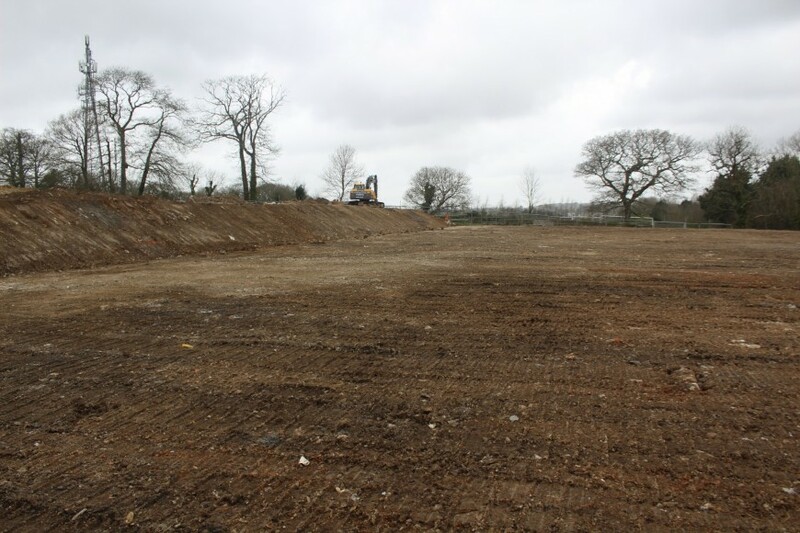 Work on the pitches on the old hospital site is well underway and the levelled pitches are beginning to take shape. Standing on the middle of the fields you can really get a sense of what a positive impact this development will have on the school as the site becomes one single site which is far more accessible for everyone. The pitches will be complete by the summer in line with the planning requirements for the housing on Union Corner that is currently also well underway. Work on the artificial turf pitch and pavilion will be starting imminently and the vision for a state of the art sports development will soon become a reality. Director of Sport at Falmouth School spoke of the excitement of the project reaching its next stage. “We are really excited about what this development will bring to the school and community and can’t wait until it is open for business,” he said. “Thanks to everyone for their continued support throughout the construction, these are really exciting times for the school. The views on the pitches are fantastic and the scale of these facilities is second to none in the county,” he added. Our plans for our students and community have been out in the public for quite a while now so we are thrilled to be finally starting the project that has got Falmouth buzzing. This work beginning now is the start of a really exciting phase where we will all be able to see things physically starting to happen on the school site. It will be at ground level to begin with as we first install both the grass and artificial pitches before we start on the sports pavilion. We would like to say a huge thank you to all of the support that we have received from the local community throughout this project and we are looking forward to an exciting 2017 as we begin to see elements of the project ready for use. First Friday of the month 'drop ins' to start. Starting from 7 October 2016 I will be holding a drop in slot for the community to come in and discuss the sports development on the first Friday of every month. Where the Fridays appear in a holiday it breaks the rule slightly so there will be no meeting in April and the June meeting will be on Friday 9 June, but otherwise the dates are fine. The time allocated is from 11 until 12:30 and I will meet in my office. I do ask that anyone wishing to take advantage makes an appointment, but these can be made on the day if need be.